U.S. Sen. Susan Collins has turbo-charged her fundraising on the backs of large, out-of-state donors and raised more money for her 2020 campaign by March’s end than she had to this point in her last three re-election races combined. The Republican senator, who is expected to run for a fifth term, has raised more than $4.4 million, surpassing the $3.7 million crowdfund that progressives pulled together for her eventual challenger after an October votefor U.S. Supreme Court Justice Brett Kavanaugh, which looks to reshaped her constituency and is leading to a nationally targeted race next year. The race is poised to smash money records for U.S. Senate races in Maine well before Election Day. Collins’ haul of $4.4 million and the Democratic crowdfund have the 2020 race on pace to smash previous fundraising and spending records in Senate races here. A national map that favors Republicans in 2020 makes Maine one of two Democratic states with a Republican senator up for re-election, increasing the odds that even more outside money will come. The senator raised less than $3.6 million to this point in her 2002, 2008 and 2014 re-election races, which she won by increasing margins and never by less than 16.8 percentage points. She had the biggest fundraising period of her career over the last three months of 2018 after the Kavanaugh vote by raising $1.8 million and things only ticked down a bit for her in 2019. 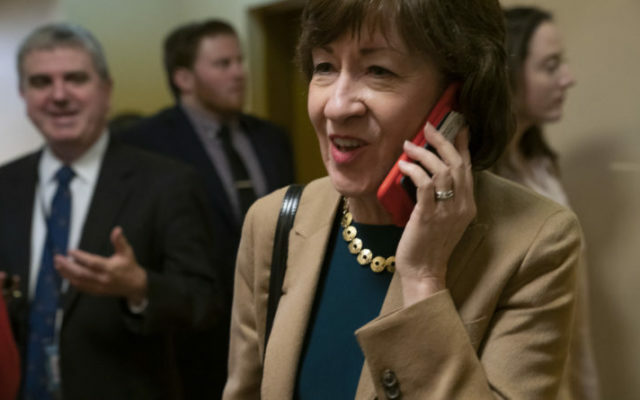 Collins raised just over $1.5 million by March’s end, with 58 percent of her money for the 2020 cycle coming from donors who gave $200 or more. A quarter of her money has come from political committees so far and another 16 percent came in unitemized donations from people giving less than $200. In 2019, donors who gave maximum contributions to Collins included Robert Mercer, a billionaire and top funder of conservative causes who played a key role in the 2016 campaign of President Donald Trump, owned a share of Breitbart News and helped elevate Steve Bannon to a top post in the Trump campaign, and his wife, Diana Mercer, and Richard Fain, the CEO of Royal Caribbean Cruises. Only $9,200 in itemized donations to Collins came from Maine individuals in 2019 — most of it from higher-ups at Bath Iron Works and its parent company. The campaign has noted that it typically focuses on national fundraising until the election year, but Collins’ operation — by necessity or not — is at a higher pitch approaching 2020. Collins looks to be in a reasonably strong position for re-election, but there is an opening for a Democrat who won’t struggle to catch up in fundraising. The incumbent appears to have a strong lead over House Speaker Sara Gideon, D-Freeport, who is seen as her most likely Democratic opponent, with 51 percent support to Gideon’s 29 percent in a poll from Critical Insights last month that also measured Collins at 62 percent approval. Such a mark would make Collins difficult to beat, but a noisy and expensive campaign could flip those fundamentals. The news wasn’t all bad for Gideon in that poll, in which 41 percent of voters said they didn’t know enough about her to say whether they approved of her or not. National money will find Gideon quickly if she runs, which probably won’t happen at least until the end of the legislative session that is scheduled for June. End-of-life care will be a focus today at the State House. Advocates and legislators who support a bill that would allow physicians to help terminally ill adults end their lives will make their case for the Death With Dignity Act at a news conference this morning. A public hearing on the bill is scheduled for Wednesday as supporters target 2020 for a referendum pushshould they fail to win approval in the Legislature. A similar bill failed in 2017 after winning initial approval in the then-Republican-controlled Senate by one vote and getting spiked in the Democratic-controlled House. Meanwhile, the budget process inches its way through the Legislature. Committees continue to make their recommendations on Gov. Janet Mills’ $8 billion, two-year spending plan to the Appropriations Committee, which has now veered into the work-session phase of deliberations. The new budget must be in place by July 1, and passage will require two-thirds majorities in the House and Senate. In other committee work, the Veterans and Legal Affairs Committee will hold public hearings on a Republican proposal to amend the state’s constitution to specifically limit voting in local elections to U.S. citizens. The measure seems squarely aimed at a proposal floated in Portland last year to allow noncitizens to vote in municipal elections. Click here to listen. The Criminal Justice and Public Safety Committee will also hold public hearings this morning on alternative sentencing and jail funding, which has been a chronic concern for state and county officials. Click here to listen.